Karen possesses a true understanding of health and wellness and possesses a vast background in the beauty industry for over two decades. Between social, philanthropic and networking events, Karen never stops. She focuses on maintaining a positive ATTITUDE and offers complimentary consultations to ascertain what the best program is for you. Her specialties are weight loss, athletic performance, healthy aging as well as positive energy and wealth creation. Feel free to call or email for a complimentary consultation and find out today if her program is the best program for you. Karen helped me get on a weight loss plan that has been a life saver. I feel amazing, I have tons of energy. This week I saw friends I hadn't seen in 5 years, they said I look younger than I did 5 years ago! She is amazing always there for guidance. She can help you over any hurdle. My rating for Karen is due to my personal experience. I struggled with my weight for 17 years after my last child born. I had been on almost every diet program out there and my weight became a rollercoaster ride. I always managed to loose weight, but at the end, I always gained it back and more of it. Until, Karen, introduced me to nutritional cleansing, and my life was changed forever! Karen, is the most genuine, driven, passionate, caring, supporting coach you will ever come across. If you are serious about taking control of your life, give Karen a call! Thank you Karen for all that you do! 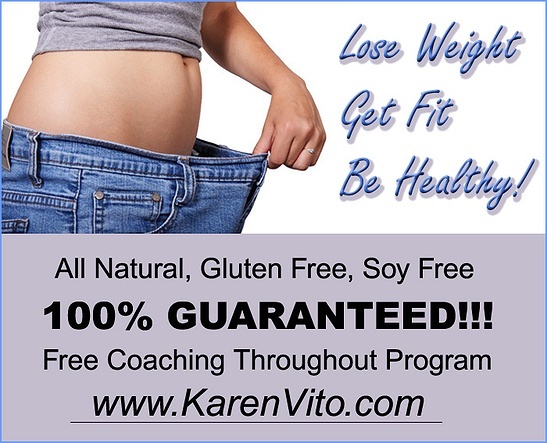 Karen Vito is an expert in Nutritional Cleansing and because of her knowledge, patience, and willingness to help people succeed in living a healthy lifestyle, I am happy to say my husband and I are 130 pounds lighter between the two of us. Karen coached us on our weight loss journey with ease. Thank God for modern technology, because there was never a time where she was not accessible to answer the simplest of questions or even to give you a boost of motivation if we fell off track. She is on top of her business because she constantly attends meetings and events and hosts launch parties to share her knowledge of nutritional cleansing with everyone! I am forever grateful to my coach Karen for changing my life thtough nutritional cleansing. I not only found my happiness once again, but I also gained a true blue friend in her, whom I trust and respect.